Caregiver of the Year Mark Lee with his table guests at CICOA's Signature Breakfast event. 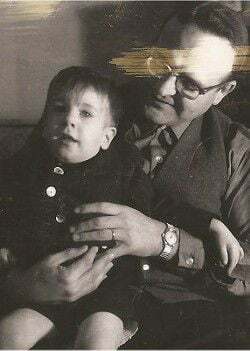 Mark A. Lee on his father Jim's lap. On Thursday morning in Carmel, several hundred people packed a banquet hall to celebrate Mark A. Lee as the CICOA's Caregiver of the Year. Mark moved in with his elderly parents in 2011 to help care for his father, who had Alzheimer's and died in 2013. Mark, a long-time NUVO photographer, blogged about his experiences "Raising Dad" at NUVO.net. The blog touched a nerve with the legions of people in the city and beyond that can identify with the challenges and the blessings associated with caring for loved ones who are no longer able to tend to their own needs. in-home assistance, served a half million meals and offered assistance to more than 3,500 people throughout Central Indiana in 2013. CICOA awarded the Caregiver of the Year award at its fifth annual CICOA's Signature Breakfast. Organizers estimated the preliminary earnings of the fundraiser at $91,000. The group's audited financial statement, included in its 2013 annual report, pegged CICOA's annual expenses at $19.2 million. In caring for what Orion Bell IV, CICOA's chief executive, called the "silver tsunami," the increasing population of the senior demographic, CICOA cares for 25 clients over 100 years old and has 11 more with 100th birthdays coming up this year. 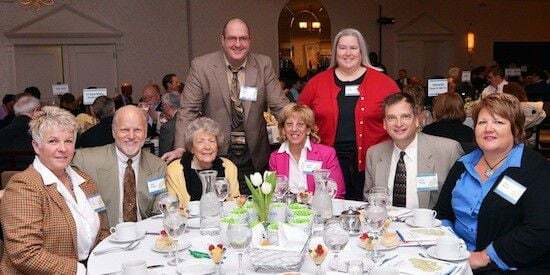 Honoring Mark's work on behalf of his father and the efforts he made to document and share his experiences, Mary Beth Tuohy, a long-time CICOA board member, noted that he "did it with humor and dignity - and was selfless." "The first thing my dad would have asked if he knew I was going to receive this award was if I was going to get paid, if there was money associated with the award ... is there?" Mark joked. He went on to say that he would trade everything for one more day with his dad - before the Alzheimer's took over. Mark invoked his father and said, "The time I got to spend with you was priceless." Priceless, but not at all easy. "I'd seen his blog and know through other friends what he was going through (as he cared for his father)," said Laura Mursall, a friend of Mark's from New Hope Presbyterian Church. Mursall nominated him for the CICOA award. "I thought if there were someone deserving of it, it had to be him. It takes a lot to give up your life. I've had friends with Alzheimer's; I know it's not easy." Most people caring for a loved on suffer at least one depressive episode and the act of caring for someone with dementia is associated with increased chance of getting dementia yourself, noted keynote speaker, Dr. Mary Guerriero Austrom, a specialist in aging. Austrom talked about the challenge of achieving a balance between personal care and the need to care for others. She said that accepting a diagnosis - instead of denying disease - is critical for people who will need to prepare to access available support offered from support groups and organizations such as CICOA. She also cautioned the audience to remember that "there is no such thing as a function family - it doesn't exist. If we start of there, we have a better chance of coping." Looking toward the 50 percent or so of family caregivers who manage to avoid depression and other pitfalls, Austrom said that people who skip the denial and aren't afraid to ask for help manage to navigate the experience in better shape. Austrom also encouraged people to have plenty of kids - especially girls - to prepare for their own journeys into old age, given that, statistically, female relatives are the most likely to shoulder the duty to care for parents in need of assistance. Mark stands as an outlier (in true NUVO fashion) to the norm on that score. He is the first man to receive CICOA's Caregiver of the Year. Mayor Greg Ballard attended the breakfast to proclaim April 17 CICOA Day in recognition of the group's 40 years of work to help improve the quality of life for senior citizens and people with disabilities. An estimated 358,000 people in Indiana provide supportive care to loved ones who would otherwise have to move assisted-living facilities - CICOA valued these efforts at $234 billion worth of support.